What the say becomes the real thing! 😐 Politics ke gande keede! 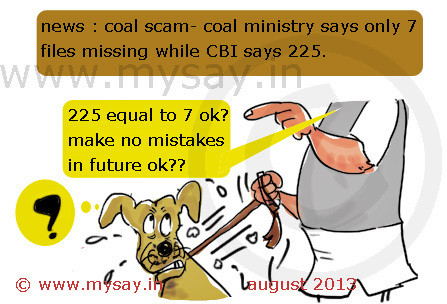 Till when CBI will fight even someday they will be on their knees as these corrupt can do anything when the requirement is of saving their $$$..But I hope CBI never give up and gets to the bottom of this one..
Haan Mili juli kisi din jaake saagar mein girenge jarur..
Ankur I am glad you liked the toon .. my intention was exactly to show how the organization is treated by the people in the govts ..